It’s Jeanette Winterson, people. I could read her shopping list and still be a happy reader. In Christmas Days we have her impeccable style and stories about Christmas. What could go wrong? If you just replied ”nothing”, you are correct. 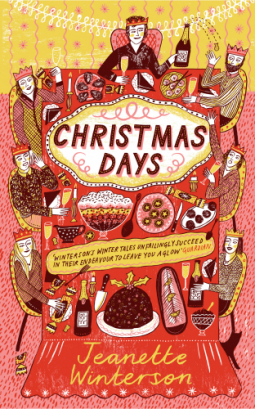 Jeanette Winterson offers us 12 stories and 12 recipes for the 12 days of Christmas. The stories are examples of different genres, each one written in a distinctive voice, each one with its own theme. The feature that makes this collection special is the recipes that we find scattered among the stories. Not to mention the lovely black and white illustrations that reminded me of those old-school Christmas pictures my mother used to collect when she was young. ”Christmas Tide” – One of the best introductions I’ve ever read. ”Mrs. Winterson’s Mince Pies” – Recipe alert! ”The Snowmama”– One of the most magical stories. If you wish to feel the spirit of Christmas (yes, I know. It sounds old-fashioned, but that’s the sentimental me now) then, this will melt your heart. Pun intended. Ruth Rendell’s Red Cabbage” – A wonderful account of the friendship between Jeanette Winterson and Ruth Rendell. And a second recipe to inspire your festive table. ”Dark Christmas” – No Christmas collection is complete without a ghost story. This one is haunting and heart-breaking. ”Kathy Acker’s New York Custard” – We have Kathy Acker, Jeanette Winterson, and references to Dylan Thomas. And New York. ”My Christmas Eve Smoked Salmon and Champagne” – Recipe- My mother wanted to try this one, but she was threatened with exile from my Christmas table and a written commitment she wouldn’t do it again. ”The Mistletoe Bride”– A true Gothic story, with hints to Jane Eyre and the Bluebird myth. Fantastic! ”Susie’s Christmas Eve Cravlax” – Jeanette Winterson gives us a glimpse of her private life. In beautiful prose, she describes the first steps of her relationship with her wife, Susie Orbach. ”O’Brien’s First Christmas” ‘- Wishes exist for Christmas’Eve after all. ”The Second-Best Bed” – Another eerie, haunting story. The ghosts of old friendships and of old wrong-doings. ”Shakespeare and Company’s Chinese Dumplings” – Who hasn’t spent hours browsing photos of one of the most famous bookshops in the world? Those of us who had the chance to visit it, feel a special warmth in our heart just by mentioning the name. ”My Mulled Wine (or No More Fruit in Main Courses) ” – Few things say ”Christmas” better than mulled wine and gingerbread houses. ”A Ghost Story” ‘- A wintery ghost story in the ski resort of Mürren in Switzerland. ”Kamila Shamie’s Turkey Biryani” – A rather delicious recipe. ”The Silver Frog” – A child’s story with Dickensian flair and a heart-warming message. ”My New Year’s Eve Cheese Crispies” – New Year’s Eve reflections, memories and delicious crispies. ”The Lion, the Unicorn and Me” – A beautiful tale in the voice of the donkey that carried the Virgin Mary and the Holy Child to Bethlehem. ”My New Year’s Day Steak Sandwich” – Another glimpse of Jeanette Winterson’s relationship with her mother, and a recipe I’m definitely going to try. ”The Glow-Heart” – Arguably, the most moving story in the collection. The beauty of love, the pain of loss and the ability to start again. ”My Twelfth Night Fishcakes” – The last story is dedicated to the Twelfth Night, a time I personally hate. Taking down the decorations and returning to the routine always make me gloomy. I hate fish as well, but that’s a different story. You need to read this book. Not only as a Christmas collection but as a beautiful example of Literature. All the joys and the aches that accompany each one of us are included in short, but so layered pieces of text, written in the engaging, immediate way of Jeanette Winterson. One of the best books I’ve ever read. Thanks for bringing this to my attention, Amalia! The stories sound wonderful, and I’ve been wanting to read more of Winterson’s books.